The winter holiday can be beautiful and bright. Christmas lights, boxes wrapped in pretty paper and excited children are everywhere. But it can be a difficult and demanding time, too. There is a lot of preparation for Christmas: shopping, cleaning, cooking and decorating. So today on our show we invite our listeners to slow down while we play holiday music released this year. That is “Pie Jesu” sung by ten-year-old Jackie Evancho of Pittsburgh, Pennsylvania. Jackie was discovered earlier this year on the television show “America’s Got Talent.” She did not win the competition. But she did get a record deal. Her Christmas album, “O Holy Night,” came out November sixteenth. The Recording Industry Association of America just rated the album platinum. That means it has sold one million copies or more. Billboard magazine says Jackie Evancho is the country’s top-selling new artist. 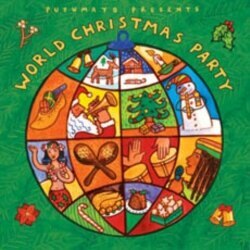 The Putamayo World Music company’s seasonal album is called “World Christmas Party.” The recording features songs and artists from Brazil, Cape Verde, New Zealand and many other parts of the world. One of the performers is the Heritage Hall Jazz Band from New Orleans, Louisiana. The band has been playing traditional New Orleans jazz around the world for almost thirty-five years. Here the band performs “Barra de Navidad Blues.” Barra de Navidad is a beach town in Jalisco, Mexico. It means “Christmas Sandbar” in Spanish. Scottish singer Annie Lennox released her first holiday album this year. However, she says she has been singing the songs on “A Christmas Cornucopia” since her childhood. In fact, some of the songs were probably playing when was born -- on Christmas night, nineteen fifty-four. Here she performs “Silent Night” which she recorded with the African Children’s Choir in South Africa. One of America’s favorite television shows also has a record out for the holidays. “Glee: The Music, The Christmas Album,” went to number three on Billboard’s special holiday sales chart. Critics’ reactions were mixed. Some praised the producers for trying new things with traditional Christmas songs. Others said the producers did not choose the right singers for the songs. The number one album on Billboard’s Top Two Hundred is a holiday recording. Scottish singer Susan Boyle’s “The Gift” has been in that position for four weeks. Boyle launched her career in January of last year. She performed on the television show “Britain’s Got Talent.” Her performance was posted on YouTube. Her beautiful voice and shy personality got the attention of huge numbers of people. She became famous almost overnight. The O’Jays are a rhythm and blues group from Canton, Ohio. They formed in the late nineteen fifties and have had seven studio albums on Billboard’s top twenty chart. Finally, Pink Martini is a twelve-member orchestra from Portland, Oregon. The group made its first holiday album this year. “Joy to The World” includes songs for Christmas and Hanukkah. There are also holiday songs from around the world like “Shehedryk (Ukrainian Bell Carol).” It is known in America as “Carol of the Bells.” The song tells the story of a swallow flying into a family’s home to declare the good fortune they will have in the New Year. I’m Doug Johnson. I hope you enjoyed this holiday program. It was written and produced by Caty Weaver. You can get transcripts, MP3s and podcasts of our shows at voaspecialenglish.com. You can also find us on Facebook and Twitter at VOA Learning English. If you have a question about American life, write to mosaic@voanews.com. We might answer your question on this show. So please include your name and country.